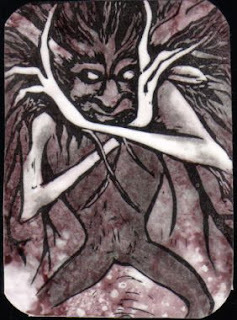 Hobyah is a card done for The Froudian Friends LTC swap which featured cards done with the art of Brian Froud as the subject matter. I used a completely new technique and did some experimenting with new materials. The image was encased beneath a slick, clear sticker material. I finished the front of the card with dapples of cranberry colored alcohol ink.